During the first two years of my collection, I positioned the relatively small wood boxes next to the miniatures in my cabinets. 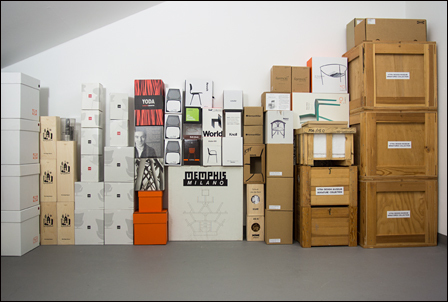 When I got the opportunity to purchase the „Edition Vitra Design Museum“, I had to look for another storage area because of the then larger wood boxes. Before long, I found a small room on the attic where I have stored all boxes neatly and clearly arranged. 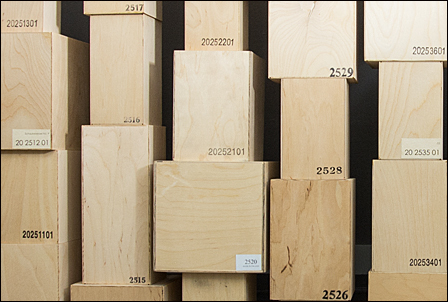 The Vitra wood boxes are classified according to their article numbers so that I can find them rapidly. The boxes of other manufacturers of miniatures also got a decent place in my now spacious „storage room“. Neat storage is important to me because the many high-quality cardboard boxes, folding boxboards, and packaging made from other materials are definitely part of the miniatures. E.g. on the left in the picture you can see the boxes with slip-on cover used by Poltrona Frau to ship the miniatures. The miniatures are packed in little fabric bags and are sometimes retained in punched-out plastic inserts fit in the box. 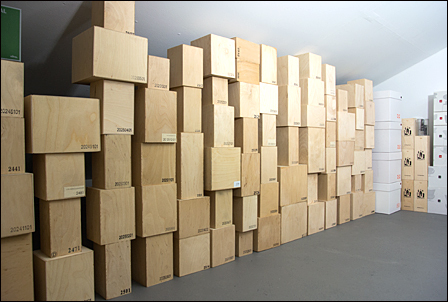 In the first two rows, there are the wood boxes for miniatures of the „Edition Vitra Design Museum“. 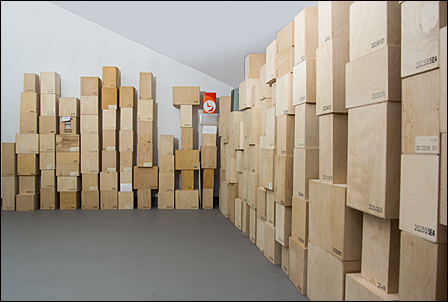 The crate for „Ghost“ by Gini Boeris is stored in the middle of the second row. On top of it – next to the costly packaging of „Dr. Sonderbar“ by Philippe Stark – you can see the cardboard boxes of the miniature outdoor chair „Luxembourg“. The boxes made from corrugated board are small-scale facsimiles of the original packing. Each little cardboard or wood box is very special because the manufacturers of miniatures attach great importance to a superior and adequate packing.